I’ve been riding since I was six years old and have been in the saddle for all of my life since then, besides a brief hiatus in college. I got introduced to horses because a neighbor owned a horse and I got to start going on pony rides. Then family members had horses and I got to ride occasionally when we went to visit. Finally, my parents made us move during middle school and agreed to let me start taking regular riding lessons. I was hooked from there! I was at the barn every second I could be there cleaning stalls, grooming, and feeding – anything to spend more time with horses. When we had to move again in high school I was allowed to purchase my first horse. Magic was a four-year-old green-broke Appaloosa so not at all what a 14-year-old girl needed, but we had a lot of fun! Magic wasn’t a great fit for me at the time, and I ended up with a lovely Tennessee Walking Horse mare named Princess who helped me accomplish so many things, from the show ring to awesome times on trail rides. I had her up until she was twenty-four years old! I rode in a variety of disciplines in the beginning of my riding career, including saddle seat and Western, but have now settled on hunters. 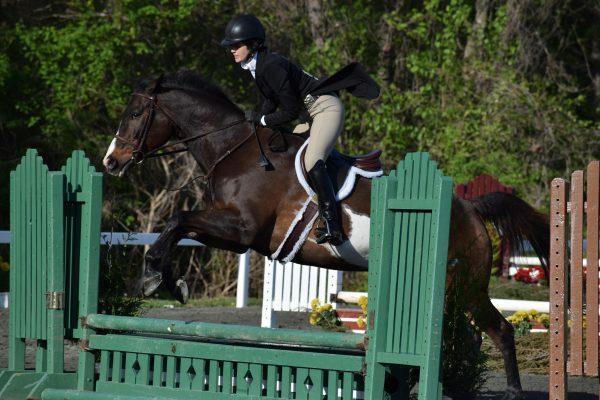 When we’re able to, I compete in the low adult hunters with my current horse, Spinner. 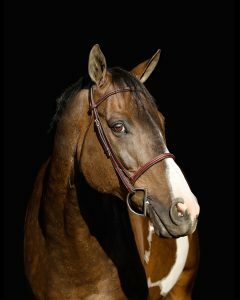 Spinner is a 16-year-old APHA-registered Paint gelding. He is full of personality in the barn and is a bit quirky – he’s pretty much the king of side eye! But under saddle, he is a saint. I was in a bad riding accident in the warm up ring almost 15 years ago that left me really scared and I didn’t show much at all after that. I started riding with my current trainer two years before Spinner came along, and she knew him well because he has been bringing riders along in the short and long stirrup ring for several years. 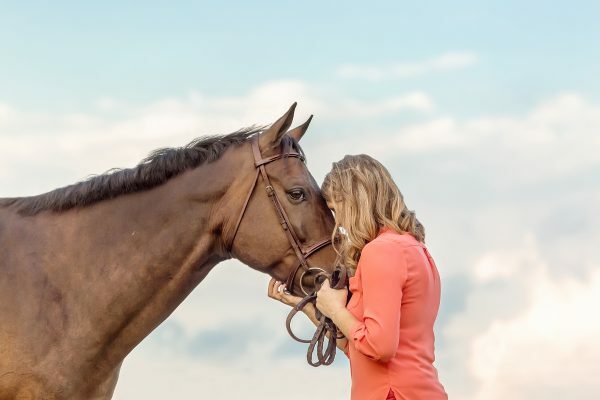 When Spinner became available, I had a lease horse that I was ready to move on from, and we decided picking up a year-long lease on Spinner was the right thing to do. Spinner is the type of horse that will never do anything to hurt you, but he isn’t giving anything away. If you don’t ask for the lead change right – he’s not doing it. If you don’t ask for a canter depart correctly, he’s perfectly content to just keep on trotting. But once you figure out his buttons – he’s perfect. Our first year in the long stirrup ring in 2016, I don’t think I ever came away without a tri-color and he took me to my first ever “AA” rated shows as well. We made the move-up to the low adult hunters in 2017, and he took care of me perfectly. Unfortunately, he was then hit with a fungal eye infection that required surgery and a lengthy vet school stay in the middle of the show season. We were able to save his eye and started bringing him back for 2018. We got to our first show this past April and went back to long stirrup, taking home two tri-colors and a derby win! But the horse injury gods weren’t done with us yet. Spinner pulled up lame in the under saddle and an MRI revealed a core lesion in his left front deep digital flexor tendon. He is currently rehabbing that injury after two rounds of stem cell therapy, extended stall rest and a conservative return to work. He is now sound and eager to get back to work and his team of veterinarians now have a positive prognosis for this injury. Only time will tell and I am grateful for whatever time I get to spend in the tack with him! Spinner was recently cleared to make the move from hand walking to actual tack work, so I decided to put him on a supplement to support his joints, tendons, and ligaments. I researched all of the formulas available on the market and looked at the ingredients, costs, and reviews, and SmartStride Ultra Pellets came out on top. Spinner feels amazing now and my trainer has even remarked that he has a fancy trot now and his flipping his toes out. I don’t know what his next ultrasound will say about his injury, but I do know that he is holding up well to his increasing workload and is staying comfortable and happy. I’m pleased with this supplement and would tell anyone else in my shoes to think about putting their horse on it for under $2 a day! I travel a lot for work and I cannot remember to get out to buy supplements or remember to order them so that my horse doesn’t run out. The fact that I can get this supplement on AutoShip is the best thing ever because I never feel like a bad horse mom! Plus, I’m in a boarding situation, so I know my horse is getting all of the supplement that he is supposed to get instead of counting on all of the different feeders to accurately measure the same amount every time. And because I order on AutoShip, I’m eligible for the free SmartPerks benefits. I like that I get 10% off all SmartPak brand products every day and the special, additional discounts that get sent out throughout the year. A new excuse to shop is always wonderful!